If you are relocating during December and you have children, then you will want to be able to take them somewhere interesting during the holidays. There are only so many DVD’s you can watch while settling into your new rental and little ones will want to be about and about doing things and exploring their new city. This city is actually very child friendly and they have a host of attractions that are exciting to visit and will amuse the children for hours, they even do a pretty good job of keeping the young at heart amused for hours as well! If your little ones have had enough of being indoors in an English winter, then wrap them up warmly and head off to visit some of the biggest London attractions. Under the sea and down by the riverside! The new Sea Life London Aquarium welcomes millions of visitors every year from around the globe to its incredible displays of aquatic life. From the new underwater walkway with its teeming display of fish and other marine animals to the Pacific Ocean Tank and the spectacular Shark Walk, the London Aquarium has over 28 extraordinary displays. Try the interactive underwater Ocean Conveyor for an entertaining and informative tour of everything that lives in the deep. Home to many of the rarest fish and reptiles on the planet, the aquarium is dedicated to conservation and the environment. You can even adopt an animal as part of their conservation campaign. It is so much more than just fish in a tank! With rainforest displays and even mermaid shows, the London Aquarium is a wave of pleasure for everyone! 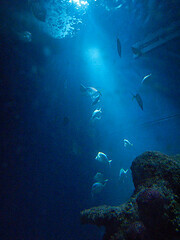 The Sea Life London Aquarium is situated on the South Bank of the River Thames and is a fun filled and remarkable day out. The feeding times and educational tours of some of the marine life is a highlight of the outing and the aquarium has many special offers for groups and families as part of their package. Ticket prices range from £18.50 for adults and£12.50 for children. Book online and get a Combi-ticket that includes other attractions like the Eye and Madame Tussauds and you will find large price reductions.